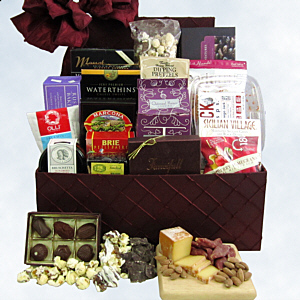 This striking burgundy box will capture their attention, while the handcrafted treats inside will captivate their tastebuds. This stunning display includes both sweet and savory items perfect for a large family or a hungry crowd. We've inldued Maw & Paw's Zebra Popcorn, Toasted Pretzels, a big box of Assorted Chocolates, Water Crackers, Almonds, Brie, Olli Bite-Sized Salame Hunks, Gourmet Cheddar Twists, Rustic Bakery Handmade Cookies, Sundried Tomato Bruschetta, Naturally Smoked Vermont Cheese, our Signature Fancifull Truffles, Mixed Sicilian Olives, Cranberry Pomegranate Snack Mix, Jack Crisps Manchego Cheese Wafers, and Bark Thins Snacking Chocolate. This group of perennial favorites can't be guaranteed to last long!